From left, Jesse Drucker, James Henry, director Karin Hayes and Lee Sheppard. Photo by Simon Luethi. It’s unlikely that you’ll ever hear Grover Norquist admit it, but Scottish philosopher Adam Smith in his seminal 1776 text, The Wealth of Nations, actually makes an argument in favor of a progressive tax. “It is not very unreasonable that the rich should contribute to the public expense, not only in proportion to their revenue, but something more than in that proportion,” Smith wrote. Laissez-faire adherents happy to adopt Smith’s free market arguments seem to have conveniently forgotten that element of his philosophy over the last 200 years. In WE’RE NOT BROKE, directors Karin Hayes and Victoria Bruce show how that might finally be changing. The film spells out the effects of a regressive U.S. tax policy so riddled with loopholes that multinational corporations with billions of dollars in annual revenue are somehow able to get away with paying no federal taxes. Thanks in part to the Occupy Wall Street movement, tax inequalities—admittedly not the world’s sexiest issue—are finally gaining attention in public discourse. Reasonably informed people have likely heard that Republican presidential candidate Mitt Romney paid an effective tax rate of about 15% last year, well below the roughly 35% rate applied to most working stiffs. WE’RE NOT BROKE makes the argument that there exists the untapped political will to change that. Following the screening Stranger Than Fiction Artistic Director Thom Powers spoke with Hayes, along with film subjects Lee Sheppard, James Henry and Jesse Drucker. Click “Read more” below for the Q&A. Stranger Than Fiction: How did you and Victoria come to this topic? What drew you to it in the first place? Karin Hayes: We came to this topic knowing nothing about it. I had not looked into corporate taxes before in my life. Our executive director, Charles Davidson, he had been following the issue with a passion and was very interested in how offshore tax havens affected the global economy. So he approached Vicky and asked her to write a book. She said, let’s do a film, we can do that much more quickly and reach more people, perhaps. He said, okay, I’ve never done a film before. So he said go ahead, and that’s how we started. STF: Lee, what does it mean to have a film like this that brings all of these disparate elements together? Lee Sheppard: It’s fascinating for us, because I work for a publication that talks to policy makers and talks to tax professionals, but it does not talk to ordinary people most of the time. So it’s nice to be able to relate this all. It was actually a dream of our founder, 40 years ago, to be able to communicate with ordinary people. Actually, he was very exercised when he founded the thing that oil companies were not paying their taxes. But they were sort of the tip of a large iceberg. But it was always his dream to be able to communicate this kind of thing, but it is hard. What this film does is boil down a lot of difficult concepts to nice graphics and nice shooting in an understandable and interesting format. STF: Where do you think this issue is in an election year? Is it going to make the radar of this election, or not? James Henry: It’s interesting. Just a month ago Obama announced that he was seeking more corporate tax cuts. And we have the Republicans, of course, proposing the zero percent tax rate as we saw in the film. Two weeks after Obama announced his plan, the UK announced another corporate tax cut. And Japan just announced another tax cut. So this is turning into a kind of global arms race. And its heading toward an end state where the state has to rely on taxes on labor and on sales, unavoidable taxes. And the corporate elite and shareholders are able to avoid taxes using offshore devices and lots of other devices. That’s not the kind of society we really want to end up with. I’m happy that this film was made, because it’s hard to talk about taxes, you’d rather watch paint dry. People’s eyes glaze over. And there was an incredible connection made with the US Uncut people that allowed this issue, which is really fundamental to the future of our democracy—the battle for our government that’s now going on. People who see the film, I think their eyes are opening up, and they’re thinking that this is not just boring. Jesse Drucker: I’m not sure if this is an issue that’s ready to take off in terms of the general public being aware of it, or it being part of the campaign. But I do think that the parallel to the Occupy Wall Street movement to me is extremely interesting. James actually summed this up very well near the end of the film. I think a lot of people in this room, like me, are fairly cynical about the ability of the public to be able to affect a political debate. As someone who has written a little over the years about income inequality, this was an issue that, until six or eight months ago, you were hard-pressed to read much about outside the pages of Pravda, maybe. 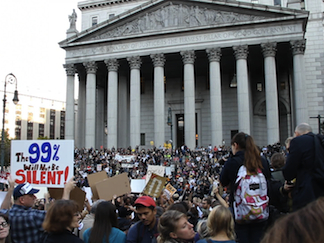 What the Occupy Wall Street movement has shown is that when lots of people take to the streets for long periods of time, it really can make a difference. It’s not clear to me what’s going to happen six months from now in terms of policy around income inequality, but it is part of the debate now every single day. It’s not that it just wasn’t this much of a part of the debate before, it wasn’t part of the debate at all. And now it’s a huge part of the debate. It is an interesting lesson that shows if there’s some kind of popular awareness of these issues and there is a mass protest that there actually is a chance that it could be a part of policy discussions. Audience: Could you talk a little about transaction taxes, and if that is a way to go? Sheppard: That is something we need to do for a variety of reasons. The Europeans are doing it now, they’ve got a European Union plan, and France is going to introduce one. There are little financial transaction taxes around the world. Oddly enough, some of them are in the countries that are regarded as very friendly to securities trading like Britain, Singapore and Hong Kong. What it is is a teensy weensy tax every time somebody trades a security. It is collected at the clearing house. I’m completely for it, I’ve written articles advocating it. It’s a very efficient way to collect revenue, because you just clip it off at the clearing house when you do the transaction. The other thing is that it would discourage a lot of disturbing practices that are going on in the securities markets, like high-frequency trading, because it basically raises the cost of trading by a little bit. But it’s a thing that you can adopt pretty quickly. We actually have one here, a little one that funds the SEC. It’s a very doable thing for revenue and for reasons of fixing some things that are going on in the financial markets that are not a good idea. Does it take care of deficit-type problems? Or can you pay for occupying Afghanistan or something with it? No, not unless you go higher on it. If you want to take care of the deficit right now repeal the Bush tax cuts. A lot of the deficit is attributable to that. Henry: The so-called Tobin Tax, it’s basically known as the Robin Hood tax. The people that are opposed to it are the big banks. The top six banks in the United States control about 85% of the international currency markets, including those in the UK and abroad. When Europe started talking about introducing this thing, it’s a perfect example of the politics of this. Treasury Secretary Geithner flew all around Europe lobbying against this tax. The worst thing in the world would be to have the Europeans go off on their own and try to adopt this tax alone. There are a lot of things that we could do with the tax system that require global cooperation. But these corporations are the only ones that are effectively organized across borders, and that’s one issue we have to address. Drucker: There’s a lot of very complicated things that need to be done, but then there are simple things like letting the Bush tax cuts expire, which would raise a lot of revenue. One of the difficult things in this area is that it’s of tremendous public interest, but if you look at a lot of public interest areas like the environment or poverty or reproductive rights, there are, with varying degrees of public funding, fairly well organized public interest groups and lobbys in Washington and around the country that are on the public’s side. There’s virtually no funded public interest lobby in Washington on tax equity issues. There’s Citizens for Tax Justice, but it’s a tiny organization with virtually no funding. There really isn’t an organized lobby on the other side of transfer pricing. The only people that really understand these issues and lobby on them are on one side, for better or for worse. That’s a very important issue, and maybe one that will change with a film like this. Audience: Do you think there’s a limit on focusing just on the issue of tax evasion? Isn’t it more of a systemic problem? One of the thing about Occupy was that it recognized the fact that what’s driving these corporations are shareholder expectations. Wouldn’t a more transformative view take on more complicated issues? Hayes: That’s an interesting point. With the film, there’s so many different levels to the issue and to the problem that we bring some of them up, like corporate money in politics. But in terms of exploring all the different levels of it, it’s a much longer conversation. Hopefully the film can serve as a jumping off point to talk about some of those things. Sheppard: The idea that corporations are only answerable to shareholders is actually a relatively new idea. It only dates from the late 80s when some business professors came up with it and leveraged buyout guys ran with it. We do have to get back to a notion that if you’re a big, giant company you serve something else. Stuff like rescuing General Motors actually helps focus this. Because you say, why did we do it? Well, because this thing had a lot of employees and was responsible to a lot of communities, and we couldn’t let it go down. But defining that thing to somebody other than its shareholders—to its communities and employees—is necessary. There is hope for us, but it takes bad economic times to get there. Bad economic times also focuses attention on taxes too, because in good times, everybody thinks they’re going to get rich and everybody thinks they’re going to be one of the people who pays only 15% taxes or something like that. Tax is the main relationship that people have with their government. Tax is also the main relationship that corporations have with their government. And corporations have a government charter—a state government charter, admittedly. But they exist only because governments let them exist.